Well, it's happened. Temperatures have dropped, and my hands have turned from soft and smooth to scaly and rough literally overnight. It looks like it's time to call in the big guns ... I'd better reach for my Bliss Manicure Maintenance Set! 1) It's thick, rich and lush. 2) It smells absolutely incredible -- light and airy without any sort of cloying annoyingness left behind. 3) It sinks into skin instantly, without creating any greasy residue. 4) It lasts for hours -- even through washing my hands repeatedly! 5) It turns my dry, cracked skin into a smooth and lustrous canvas almost instantaneously. 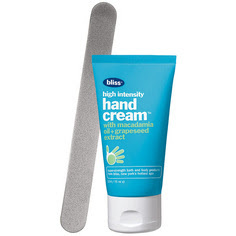 The Bliss Manicure Maintenance Set retails for $46 at blissworld.com.